Tomorrow will be day four of Sky being home sick. I mean miserable, cranky sick. Mark gets all the parenting points this week as he’s been working from home to take care of her. I am beyond thankful he is able to work from home, that he didn’t have meetings he had to be at the office for, and that I didn’t have to worry about finding a sub at my work. Very thankful we have the jobs we do and they allow us to be flexible in different ways for our family! Today I’m thankful I’m not a Federal Employee who is working without pay, or not able to work at all because of the shutdown. Most people in this country can’t get by if they miss even one paycheck. The potential fallout from the shutdown continuing could be catastrophic for some. Sadly with such a volatile and unpredictable person (who won’t feel any personal financial impact BTW) in charge who knows how/when it will end. Until then I’m thankful Mark and I have jobs that are secure, and we will do what we can to help those we love that may be impacted. Who doesn’t love rainbow ponies and little cowgirls?! Throwing it back a few years with this one because it makes me happy and the state of current affairs is too much sometimes. What are you thankful for today? What makes you smile? Today I’m thankful that Mark takes on projects, like Gingerbread Houses with Sky. She’s been wanting to do one for a few years now, and for whatever reason I’m just not that into them. I guess I don’t see the point, and I don’t really enjoy making messes, so it’s not been a priority. However, Sky has been asking and asking, and Mark picked one up for her and then spent several evenings working on it with her, for which I’m very thankful! Gingerbread house Christmas tradition complete! For really real you can have a beyond yummy Thanksgiving Day Turkey cooked and ready to serve in two hours! And, I’m not talking small turkey, I’m talking big enough to feed the family turkey (22lb’s the first year I did this method)! I’ll be totally up-front that the origins of this recipe are unknown, and I am in no way taking credit for this recipe, or claiming it as my own. That’s not stopping me from sharing it though because frankly it’s brilliant! 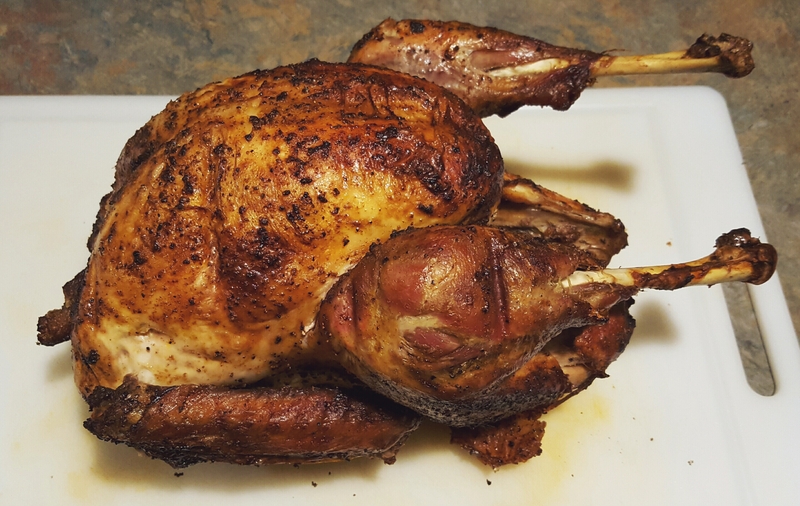 I’ve lost count of how many turkeys I’ve cooked at this point, but no matter the size (from 22lb down to 12lb) it always turns out perfect. Just know, if you offer to cook the turkey using this method, that will become your “thing” every Thanksgiving forevermore! Here’s what I love most about this process…it leaves me free to do whatever I want Thanksgiving morning…which mostly means watching the parade, in pj’s, with a mimosa! Not gonna lie it does feel a bit “wrong” to be relaxing all morning while everyone is posting on FB about being up early and the turkey’s in the oven, and I haven’t even started thinking about it. But, on the flip side it feels really great to sleep in and enjoy the morning! The best part…since it only takes two hours there is no reason not to cook turkey any time of year. No need to wait for a special reason or holiday. If you like turkey this makes it way more accessible any time of year, time wise anyway. 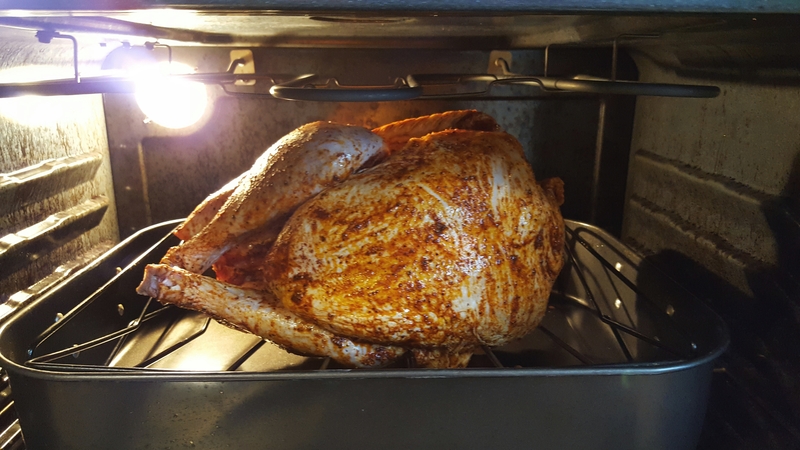 Roasting the turkey on its side makes better use of the heat and shortens the cooking time! Cut the “crop skin” at the neck of the neck of the bird off, and cut wings off at second joint. Also, cut off the tail. Salt and Pepper the turkey inside and out. Sprinkle a generous amount of paprika on the turkey (I sprinkle inside as well) and massage into the bird using 1 cup of oil, coating the entire bird. Arrange the turkey on its side in a roasting pan, on the roasting rack. Roast bird at 400 for up to 2 hours, a little more or less may be needed depending on size of turkey. 3/4 of the way through cooking remove turkey from oven and turn on to its other side. Be careful not to pierce the skin as you do not want the juices running out. (I use two kitchen towels…make sure they are not nice ones as the paprika will stain them). As the skin darkens and becomes crispy, the meat should be checked to see if it’s done. The skin should look like a new football. Make a small cut in the thigh joint and if juices run clear the turkey is done, you can also insert a meat thermometer and when it reads 165 the turkey is done. Let rest for 10 to 15 minutes before carving. Serve with good company, yummy sides (for real the turkey is so easy you can get fancy with sides if you want to), and good wine! Today I’m thankful for the beautiful place we call home. I love that we are only a few hours from the ocean or mountain depending on which way we feel like driving. The PNW is beautiful (even with gray sky’s and rain now and then). I’m super thankful that our house is located close to several parks and some amazing views, and that we have easy access to green spaces and outdoor activities. My heart is happiest when enjoying the outdoors, and I’m thankful it’s easy for me to do so weekly! Today I’m thankful for a Team Yeatman Fall adventure. We took Sky to her first corn maze! It was my first non-scary one, and let me tell you I enjoy the kid friendly corn maze much more than the scary one with clowns and chain saws jumping out at you! There were 8 trivia questions to answer and let me tell you it was a challenge navigating all the circular paths and dead ends to find all 8. But, Team Yeatman worked together and made it out! I don’t know why we waited 7 years to do a corn maze with Sky, but we had a blast. New Fall tradition! I’m always so thankful when we can do stuff just the 3 of us and have fun. Having friends join in is great as well, I’m just happy we enjoy being Team Yeatman, and can just be us and still have so much fun. Sea lion under a restaurant in Astoria. Just sharing some of the random pics I have from summer activities. Our October has been so nice it sort of feels like summer is just now ending. Today starts a stretch of rainy weather. There’s been a chill in the air in the mornings and evenings as well. Human Foosball at Chambers Bay Kite Festival. Winter is coming! I’m ready though…I wasn’t that into it last year, the weather/holidays/snow, but this year I’m feeling it and ready to embrace the Winter months and all they bring. Sky was invited to cheer with Clover Park Cheer team during a football game…so much fun! She taught her friends the cheer and they learned it so well that they all got to participate. Nicest group of girls and they made Sky feel so welcome and part of the team!